Hello! 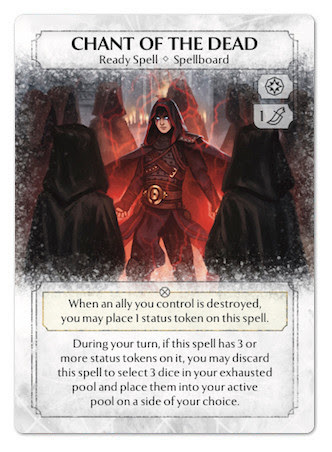 Here I am again with a new article discussing the basics of Ashes and the preconstructed decks that come with the base set of the game. Today, we’ll take a tour into one of the darkest and bloodiest sides of magic with Jessa Na Ni, Phoenixborn of the Bloodwoods Clan, and her deck: The Bloodwoods Queen. Be aware: this isn’t a trip for soft-hearted people! 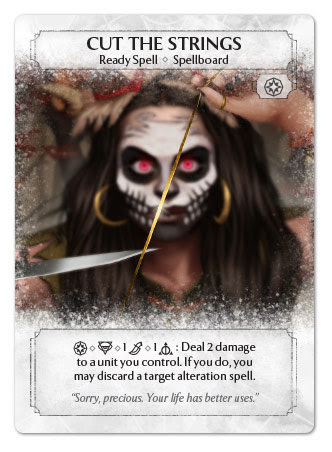 Jessa Na Ni has a pretty average stat line, with 18 life points, a battlefield value of 5 and a spellboard of 4. Nothing really shiny here, but no great weaknesses either: she has a decent survivability and can field a good array of spells and units. 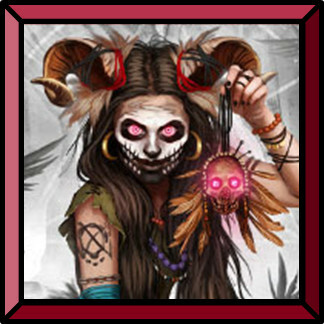 Her special ability, Screams of the Departed, however, enables Jessa to spend 1 basic dice in order to deal 1 damage to her opponents every time one of their units leaves play. Direct damage to a Phoenixborn is inherently good in this game, and benefiting from a consistent way to bleed your opponent out is definitely super-good. The only serious drawback to this ability is its cost, both economic, temporal and situational: you’ll spend a lot of dice to use Screams of the Departed repeatedly, which in turns means you’ll need the time to trigger it again and again, and to do so you’ll need to make enemy units leave play (which, by the way, is not a difficult task with this deck, as we’ll see in a moment). 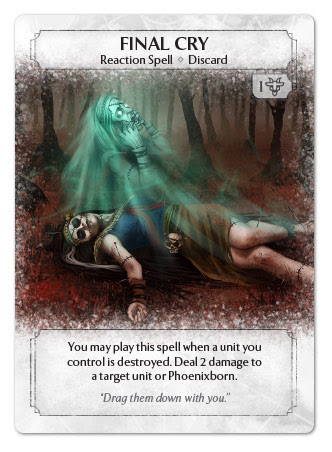 Given Jessa’s inclination to stall out the game and delay the enemy plans as much as possible while she stings their Phoenixborn to death with Screams of the Departed, having a way to increase the endurance of her units, and to recover the allies that will eventually die from her discard pile is vital to Jessa’s survivability. With possibly exception, Jessa won’t be attacking too much: her tribesmen will form a protective shield around her, willingly sacrificing their lives to increase her power and to punish the enemy for daring to attack their queen. 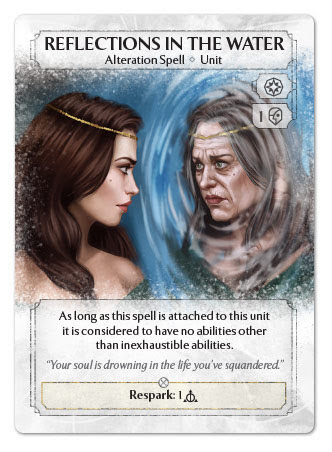 Fear is Jessa’s unique card, and what a card! With no cost besides a Main Action, this powerful Action Spell makes a unit controlled by an opponent leave play, returning to its owner’s conjuration pile if it’s a conjuration, or to their hand if it’s an ally. This is a wonderful game stalling card, the biggest and more expensive its target, the more satisfying it is to play it (and the larger the dice advantage you’ll gain, turning all the dice the opponent spent to play that unit into a waste of resources). 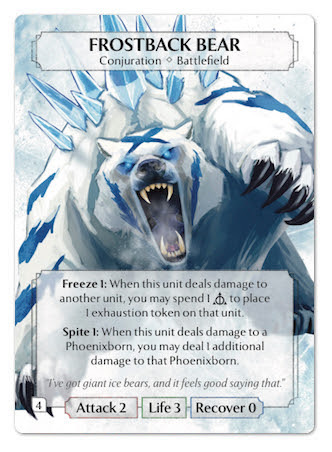 Iron Rhino, Hammer Knight, Dread Wraith, Frostback Bear; you name it, no one is safe from Jessa (unless they are immune to spell effects, like the Seaside Raven, that’s it). 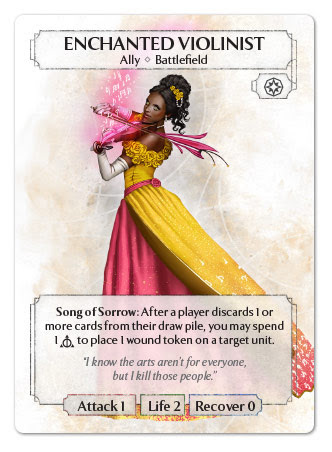 Moreover, by making enemy units leave play almost for free, Jessa has a super-cheap way to trigger her Screams of the Departed and add insult to injury by dealing damage to the enemy Phoenixborn… what else to say? Too bad it’s a unique card and can’t be splashed in every deck. But maybe it’s better this way. As a final note, effects that trigger on a unit being destroyed (i.e. 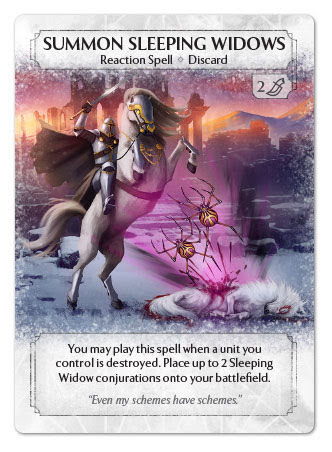 Chant of Revenge, Chant of the Dead, or Summon Sleeping Widows) can’t be used as a reaction to Fear, since the affected unit leaves play without being destroyed. 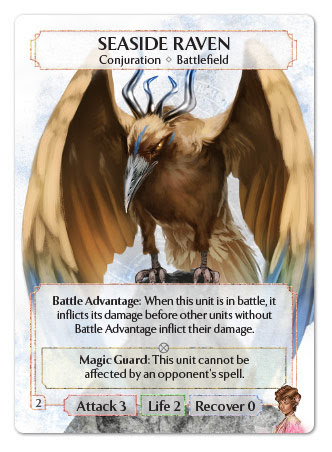 With no “standard” summoning spells and two cards that force you to inflict damage to your own units in order to resolve their effect, Jessa’s spellborard is quite different from that of other Phoenixborn’s decks. The purpose of her ready spells is to ensure Jessa’s survivability by making the enemy waste resources and negating progress they have made during the turn. Also, as we’ll see later when discussing allies, you’ll actually benefit from damaging your own troops, turning a resource trade (unit life for a beneficial effect) into a potential gain. 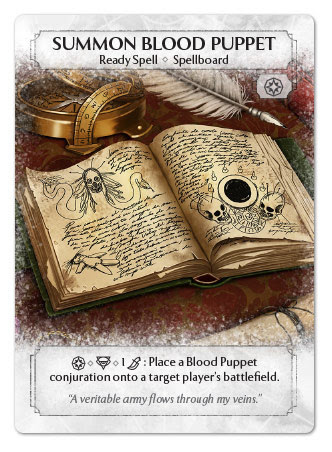 Jessa’s only summoning spell is Summon Blood Puppet, which is as cheap as a ready spell can be, costing nothing but a Main Action to play, and a Main Action plus a Ceremonial die to activate. 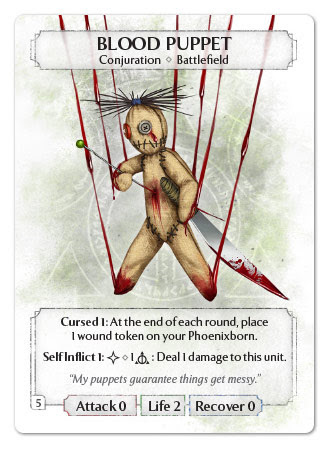 The Blood Puppet itself is an OK blocker, with no attack and a life value of 2, though its abilities are a real pain for its controller: Cursed 1 will place 1 wound to your Phoenixborn at the end of each round (bypassing any damage prevention effects, since it causes direct wounding), while Self Inflict 1 allows you to spend a Side Action and a Basic Die to deal 1 damage to the Puppet, so that you can destroy it before the end of the round and thus avoid taking damage from Cursed… mmh… on a second thought it’s not that cheap… it hurts you, and it it forces you to spend dice and side actions for the sole purpose of getting rid of it. That’s annoying. But wait, here’s the catch. You can place the Blood Puppet in any player‘s battlefield, so you can actually give it to your opponent. Now they become the controller of the conjuration (remember: you control anything that is in your play area, battlefield, spellboard or attached to cards you control), and thus they’ll be affected by the Puppet’s annoying abilities. For a mere ceremonial die you’ll fill up a slot in the enemy battlefield with a unit that, if not destroyed in another way, will either deal 1 unpreventable damage to your opponent (that will trigger even if the Blood Puppet is exhausted once, as one exhaustion token will go off in the Recover Phase, before the end of the round), or will force him to waste 2 turns and 2 dice. 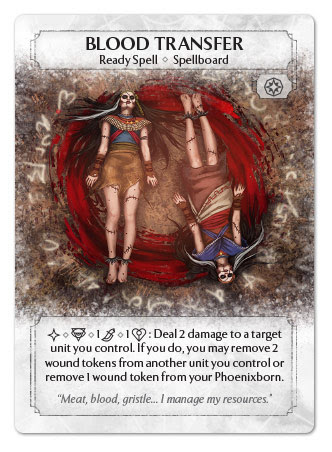 And if your opponent destroys the Blood Puppet to prevent Cursed from triggering, or uses it to block one of your attack, you can benefit from it anyway through Jessa’s Scream of the Departed. 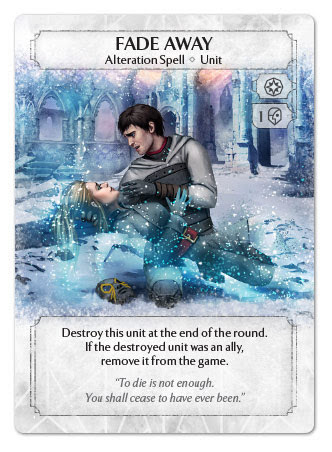 I’d say this card is perfectly fitting Jessa’s theme of punishing the enemy for the choices they make. Don’t you agree? 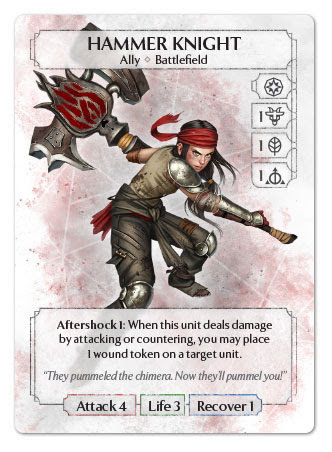 One of the two “life sacrifice” spells in Jessa’s arsenal, Blood Transfer allows you to spend a Side Action, a Ceremonial die and a Charm die to deal 2 damage to a unit you control in order to heal either 2 damage to another unit you control or 1 damage to Jessa. This is a good, yet somewhat expensive, way to increase your survivability or to prevent a key unit from dying while at the same time providing an alternate way to trigger the Living Doll’s and Leech Warrior‘s abilities should your opponent be shy and decides not to attack you. 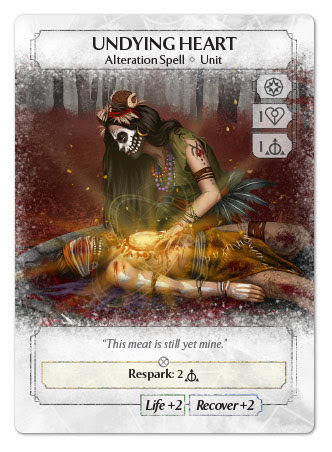 Similar to Blood Transfer, Cut the Strings also requires you to deal 2 damage to a unit you control in order to trigger its effect, this time discarding an alteration spell. 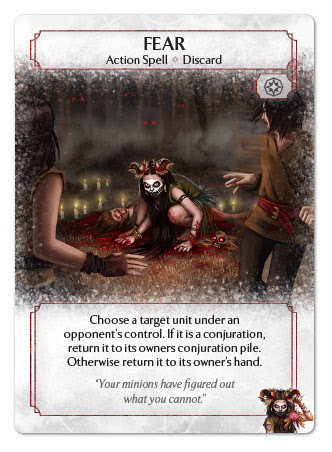 Its activation cost is a bit more affordable than Blood Transfer‘s, requiring a Main Action, a Ceremonial die and a Basic die. 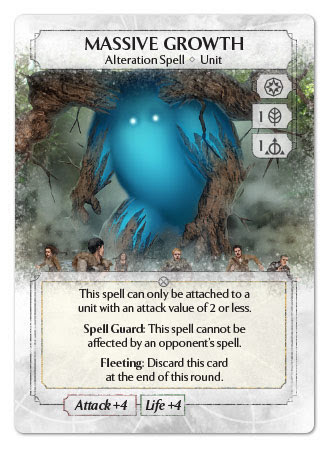 The list of alteration spells you might want to discard with Cut the Strings is long (and will get longer as the game progresses, with new cards coming out), but major offenders include alterations that threaten your own units: Fade Away, Reflections in the Water, and Regress. 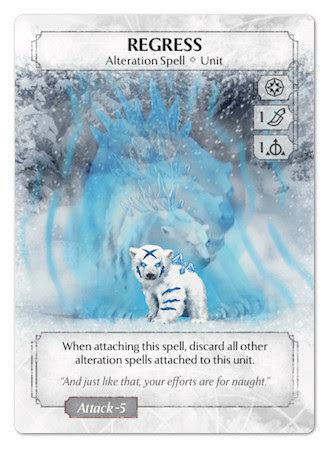 Note that, while you would have all the reasons to discard a Massive Growth from play, its Spell Guard ability prevent it from being affected by Cut the Strings so you can’t do nothing about it except from destroying the unit it is attached to. The Bloodwoods Clan comes to the aid of Jessa Na Ni with an array of allies with medium-level stats and incredibly annoying (for your opponents) abilities. 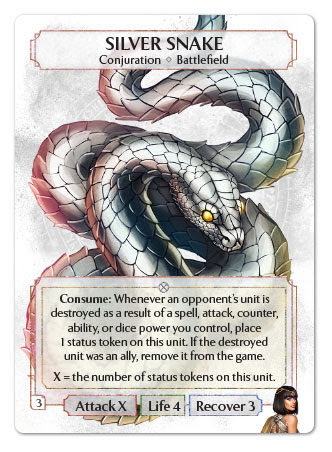 Their big drawback is their non-trivial magic cost, which makes them an investment that must be protected, especially from effects, like Fade Away or the Silver Snakes‘ Consume ability that would remove them from play. Having 5 ceremonial dice at your disposal, you always have the option to take them back from your discard pile, but if one of them gets out of play, it’s gone for good, which is something you don’t want. One of the most annoying units in the game, the Leech Warrior has pretty good stats with an Attack of 2 and a life value of 3, plus a recovery of 3 which makes him heal any damage that doesn’t kills him outright. And you’ll want him to take damage, because his special ability, Shadow Drain 1, will force an opponent to exhaust an active dice of your choice every time the Leech Warrior receives any amount of damage. 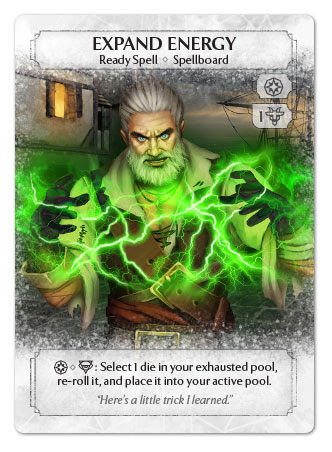 This will help you limit the options at your opponent’s disposal (unless they have dice-recursion options like Expand Energy or Hidden Power) and consequently drag the game longer, which is something Jessa wants because of her general lack of burst damage. Similar to the Leech Warrior in cost and purpose, the Living Doll is another medium-sized unit with an ability that triggers on receiving damage. 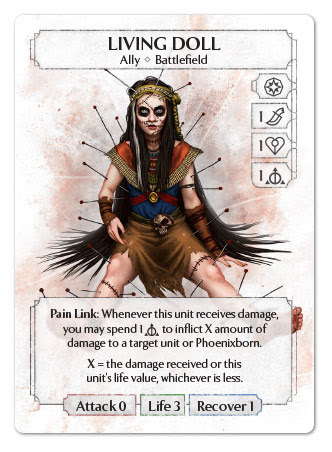 This time, her Pain Link allows you to spend 1 basic dice to deal the same amount of damage she receives (up to her Life value) to a target unit or Phoenixborn. With both these and the Leech Warrior, attacking Jessa risks to become expensive in terms of both resources and life loss. Moreover, with an attack value of zero, the Living Doll can be recovered through the Ceremonial Dice Power at no additional costs, making her easier to recycle than the Leech Warrior. Remember that Life Value can be modified by alteration spells, but is not affected by wound tokens, so an unaltered Living Doll which already suffered two wounds still has a Life of 3, and that’s the damage she’ll deal with Pain Link if she suffers 3+ damage in a single instance. One way to deal with these two units is to directly place wounds on them, via effects like Molten Gold, the Enchanted Violinist‘s Song of Sorrow or the Hammer Knight‘s Aftershock abilities: as explained in the FAQ, these effects bypass the “Receive Damage” step of the Damage and Destruction Resolution Process and thus do not allow their target to trigger reaction based on receiving damage, so be aware when playing against decks including those cards. 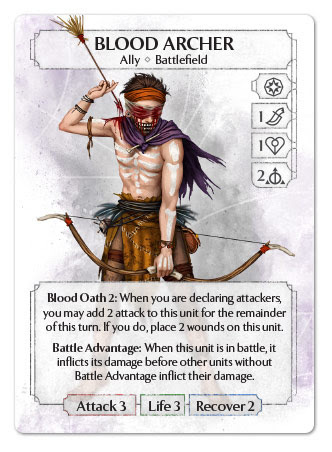 While the Leech Warrior and the Living Doll thrive when receiving damage, but have little to no direct offensive capabilities, the third and final ally in Jessa’s tribe, the Blood Archer is among the strongest fighting units currently in the game, were it not for his high cost. His Battle Advantage ability allows him to snipe enemy units and makes him a good tool to clear the board and feed Jessa’s Screams of the Departed, or to keep enemy attackers at bay. 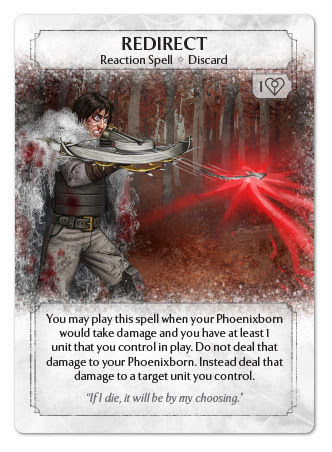 When needs arise, you could increase his attack value to 5 and punch hard at the enemy Phoenixborn, but this makes the Blood Archer extremely vulnerable to 1-damage effects like Nature dice or the Enchanted Violinist‘s Song of Sorrow. 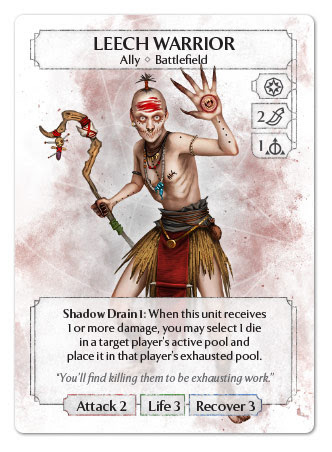 Combine this with the Archer’s high cost of 4 total dice and the potential 3 damage you’d take when recovering it from your discard pile through the use of a Ceremonial dice power, and you’ll understand why you’d want to keep this ally in play as much as possible. 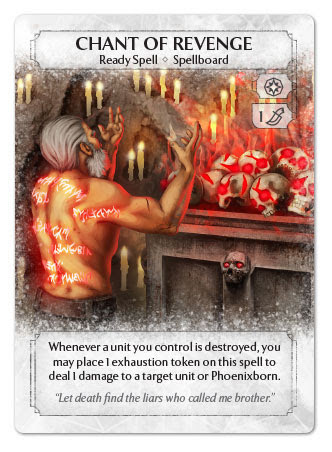 This deck has tools to achieve such a task in the form of Blood Transfer and Undying Heart, but don’t be afraid to step in with your Phoenixborn to protect him from an attack either, and never forget the usefulness of the +1 bonus to Attack and Life granted by the Charm dice power. As you might have noticed by now, Jessa definitely prefers her allies to shield her and take damage in her stead, triggering nasty stuff like Shadow Drain or Pain Link as a result. Her reaction spells further enhance this attitude by providing other ways to exploit her units’ sacrifices. Final Cry is a quite cheap way to deal direct damage to the enemy Phoenixborn without sacrificing tempo. At 2 damage for just 1 dice, it’s one of the most cost-efficient direct damage effects in the game per se. The drawback is that you need a unit to be destroyed in order to trigger it, but that shouldn’t be too hard to achieve. Regardless of the deck you are playing or facing, unit removal is not too hard in Ashes. Moreover, you want your units to take damage. To say you’ll find ways to use Final Cry sooner or later is a pretty safe bet. Fact is, your opponent knows you might have a Final Cry in your hand, especially if you keep a Ceremonial Power die available, so they play sub-optimally and attempt not to destroy your units until you run out of Ceremonial dice. 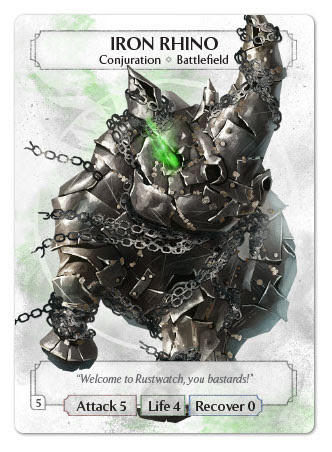 This might give you time to ensure their survivability through the use of Charm dice or Undying Heart, rendering any future attempt at destroying them this round useless. Either way, you win. Jessa’s kit also enables her to trigger Final Cry herself, if needed, by using damage-dealing effects such as Blood Transfer and Cut the Strings with the added advantage of being able to trigger effects that happen on receiving damage first. 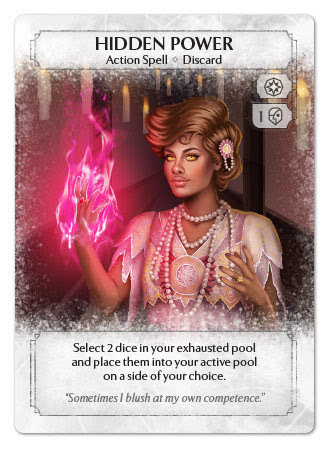 Jessa’s second Reaction Spell it’s another extremely useful and versatile card, which can easily fit in any deck that uses Charm dice. For a single Charm symbol, Redirect allows you to… err… redirect all the damage your Phoenixborn is going to suffer onto a unit you control, getting the twofold effect of preserving Jessa’s life a little longer and potentially triggering all those annoying effects you can trigger when your units take damage or are destroyed, which I’m pretty sure you are familiar with by now. It also can protect Jessa from an attack even if your units have been exhausted, effectively granting an exhausted unit the ability to defend from that attack, giving you a big surprise factor. Always remember that effects like Molten Gold don’t deal damage, but directly place wounds on the target, so Redirect can’t do anything to block them, otherwise any other source of damage can be redirected on a unit you control, be it a direct damage effect or an attack. Speaking of which, when defining how much damage is redirected when Jessa takes damage from multiple attacker, you need to consider whether she is the original target of the attack, or is going to take damage because she stepped in to protect a creature being attacked. 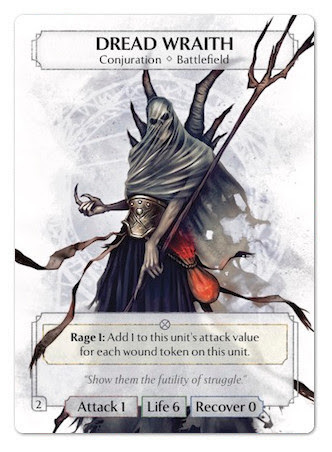 If the opponent declared multiple units as the attackers in an “Attack a Phoenixborn” action, then each unit’s attack is resolved separately, and you could only redirect the damage from a single unit. When suffering damage from an “Attack a Unit” action, instead, all attacking units will add up their attack value and deal that much damage in a single instance to the attack target, this means that Redirect will move all the damage Jessa would suffer from that attack to a unit she controls. Long story short: when playing against Jessa be extra careful when declaring attackers – especially on a unit – if you see a Charm dice in her active pool. 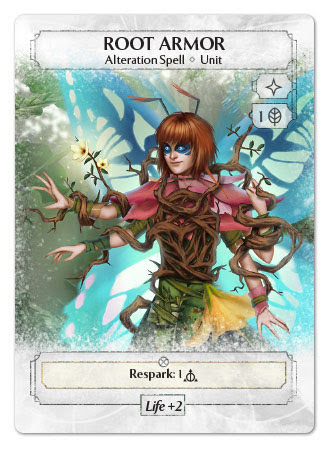 Jessa’s Alteration spell, Undying Heart, provides additional survivability to a unit, by increasing its Life and Recover values by 2 points. Multiple ways to deal damage directly to the enemy Phoenixborn, the most important of which, Screams of the Departed is always available. Relatively high toughness of both the Phoenixborn and her units. Summon Blood Puppet. ’nuff said. (Yes, I know, I usually list three strong points, but Blood Puppets are so cool they deserve a separate entry). Very few attacking units, and, on average, low burst damage capability: you would most likely slowly bleed the enemy away 1 damage at a time rather than inflict a few, powerful, hits. Many cards have above-average costs, or require you to pay extra dice to activate, making you burn through your dice pool quickly if you are not careful. 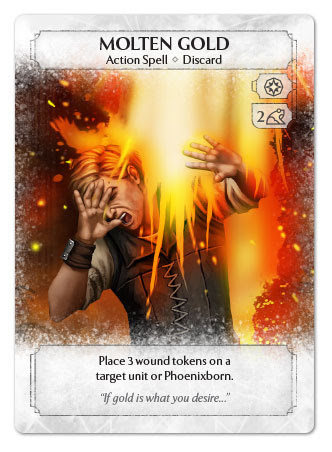 Many effects require your units to suffer damage in order to trigger, making them vulnerable and potentially leaving your Phoenixborn defenseless. And with that, we are halfway done, at least for the base set. 3 Phoenixborn done, 3 more to go. Next time we’ll explore the ruins of the once beautiful city of Viros in search of the man who was supposed to be its champion, and instead burnt it to the ground: Noah Redmoon. Until then, if you have any comments and/or suggestions, please feel free to leave a message below. 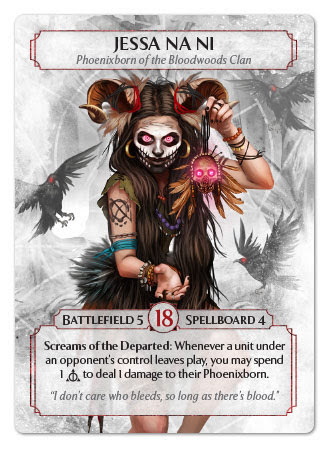 If I attach Undying Heart to a Living Doll, I could potentially inflict 5 damage to the enemy Phoenixborn in a single blow, couldn’t I? Thanks for all the article, I find them very usefull for a newcommer. Yes, the maximum amount of damage the Living Doll can potentially deal with each use of Pain Link is equal to Doll’s Life value, so if you raise it with alteration spells or using the Charm dice power, you can potentially inflict more damage with her ability.